This gluten-free curry is just right for those days when the time gets away from you and suddenly the kids want dinner RIGHT now - just mix it all together to cook and enjoy. I’m cooking all the time, so you’d probably assume that dinner is always planned and ready. You’d be wrong. In fact, I’m usually whipping something together at the last minute, because I’ve spent all day making videos and running the kiddo wherever and talking to my clients and on conference calls and… and… and I know I can cook if I have the basic ingredients, so I don’t sweat it until I have to. Which sometimes leaves me sweating. So, when the folks at Kitchen Accomplice asked if they could send me some of their broth concentrates to try, I was all in. 1 bottle makes 28 cups of broth, which means I have a high-quality pantry staple handy with easy storage and minimal waste. Yaaaas, y’all, I’m all about that. 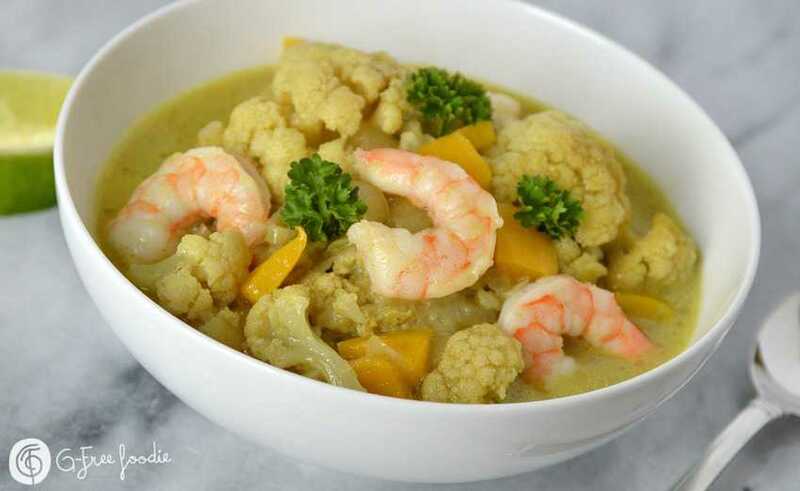 I had a bunch of veggies from my CSA delivery and a hankering for gluten-free curry, so this Easy Green Gluten-Free Curry with Cauliflower and Shrimp almost made itself. You could easily leave out the shrimp for an all-veggie version, and that would be delicious too. Maybe throw a diced potato in there. Delish. *Make sure your green curry paste is gluten-free! I like the green curry (and all the curry pastes) from Thai Kitchens. Heat the oil in a large dutch oven, and add the curry paste and saute over high heat for 1-2 minutes. Add the onions and reduce the heat to medium-high, and cook for another minute or two. Then add the cauliflower, bell pepper, and salt and stir well. Pour in the broth and coconut milk, stir to combine, cover and let the mixture simmer until the cauliflower is soft, about 8-10 minutes. Uncover and add in the shrimp, cook until until shrimp are opaque and cooked through. Serve with topped with cilantro and lime wedges, and with steamed rice or rice noodles if desired. The folks from Kitchen Accomplice provided materials for this post. All words and ideas are my own. Thank you for supporting the brands I work with, which allows G-Free Foodie to grow. 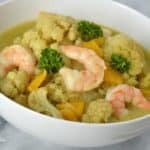 This entry was posted in Dairy Free, Main Dishes, Paleo Friendly, Quick & Easy, Recipes and tagged autism diet, autism gluten free, dairy free, dinner, food allergies, g-free diet, G-Free Foodie, gluten free, gluten free cooking, gluten free diet, gluten free food, kc cornwell, paleo, paleo friendly. Bookmark the permalink.